Soaked in hot water, dried herbal flowers restore their beauty they once had, bringing you a touch of nature. You will feel relaxed and comfortable with the herbal flower tisanes... What a good thing it is to enjoy the rare flower tisanes with a favorite book or a couple of bosom friends! With the boredom that can come from city living, a person will sometimes look for something a little different to spice up an otherwise dull day. The usual coffee, tea, wine or coco drinks become passé. I want something fresh, something from nature. It is spring finally, a friend comes and brings me a gift - a caddy of herbal flower tisanes. At night, alone, I make a cup of the tisanes for myself...picking up several tiny flowers and a bit of tea, putting them in a glass pot and adding in some boiling water. After a brief wait, clear golden tisanes flows from the hand-warming pot. Tender fragrance of the flowers overflows within my throat with every mouthful. Looking at the tiny flowers and leaves floating in the pot, I suddenly have a beautiful feeling. It is because, I know, that what I have drunk is not only from the flowers and their fragrance but also the sunshine, rain and dew as well as the natural nutritious components in them. With all of them in my body, I feel so warm and comfortable that it seems to me as if the dryness of spring has left me. Just at that moment, I fall in love with the herbal flower tisanes. There are more and more reasons for the tisanes to be loved since every kind of flower or plant included has its own health care function. For instance, the rose can invigorate blood circulation so as to make one look younger, lavender relaxes nerves; chrysanthemum relieves internal heat or fever, to mention some examples. What is herbal flower tisanes? 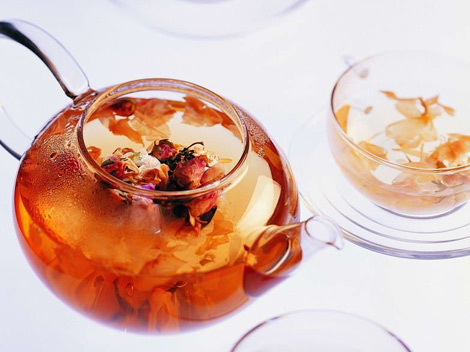 The tisanes is made of the dried parts of all edible plants --- roots, stem, leaves, flowers and skins --- and, with or without tea leaves, it is called herbal flower tisanes. The history of herbal flower tisanes is long and people have studied it since ancient times in both China and Western countries. A drink which has been popular among people for many years, this tisanes does not contain caffeine, has a low content of tannin and calories but is rich in vitamins and minerals. It is considered beneficial to the promotion of good health and for hundreds of years people have used it as a mild auxiliary therapy. Most of the time, it has no side effects.